June | 2015 | Can Men Cook? Are you a tea person? Have you been a tea bag junkie for years – like us? It feels easier, quicker, less mess, less hassle? Like a ready meal, or a courier delivered pizza? I want to let you into a secret world of taste. 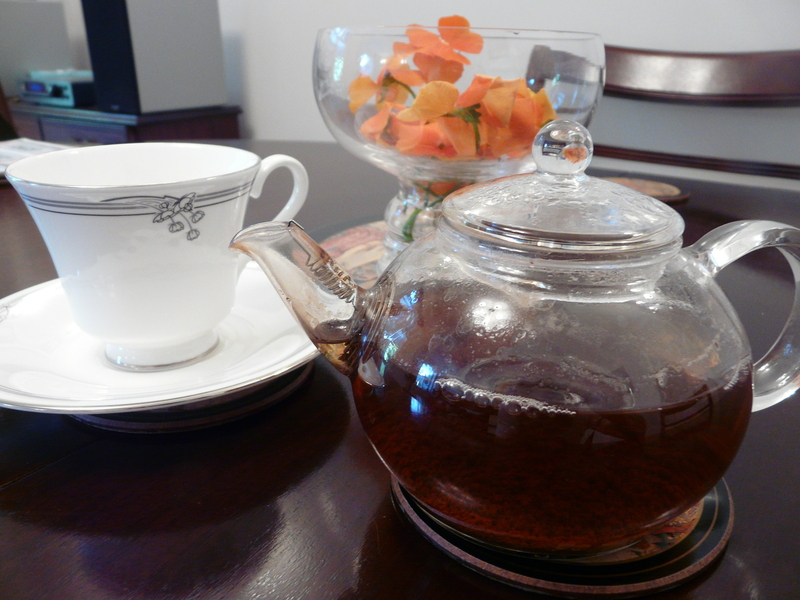 Loose-leaf tea and the tea pot (Sounds like a new novel?). Finally found some tea – ostensibly the same brand and type as the last tea-bags. But there, dear reader, the similarity ended. Two spoons, after warming the pot and rinsing with boiling water. Stir. 3 minutes, and strain to serve. The reward? More nuanced flavours, greater depth, smoky and tangy gorgeousness. You get varying reports on Trip Advisor. Don’t be fooled by the occasional 1 star. This is probably from either jealous competitors or people who don’t like change. Look, I love my ham egg and chips lovingly created at The Crooked Billet in Sheepridge Lane – but that’s pub food – proper, and good and real. The Coach is like pub food designed by Picasso…sort of looks like what you expect but is a bit different? It was fab. Intense, yes, mushroom led, lots of herbs, two different cheeses, lively, and a frighteningly full flavoured and satisfying dollop of gorgeousness. (Dollop sounds too negative…but I just got too excited). “Chilli” it says on my receipt. “Venison Chilli with Toasted Rice Cream, Red Wine and Chocolate” is what it says on the menu. Better! But it doesn’t warn you of the Picasso like deconstruction again. Rice is toasted until it is dark, then the alchemists cook it to a cream, and then foam that somehow (I’m an at home cook…I didn’t quite understand when Nick Beardshaw, Head Chef, explained this to me…I don’t need the detail. That’s their job. It was just great fun to eat.) And when you make a comment, someone will always stop in their tracks and explain a bit more. It is just passion and love. The chips went with both the chilli and the quail. They are a wonder in their own right. Fat. Big, Dark, Crispy. Dry. And you dip them into Bernaise sauce. What’s not to love?? “Quail”? Whole Stuffed Rotisserie Quail, is the menu description. But this doesn’t do it justice. 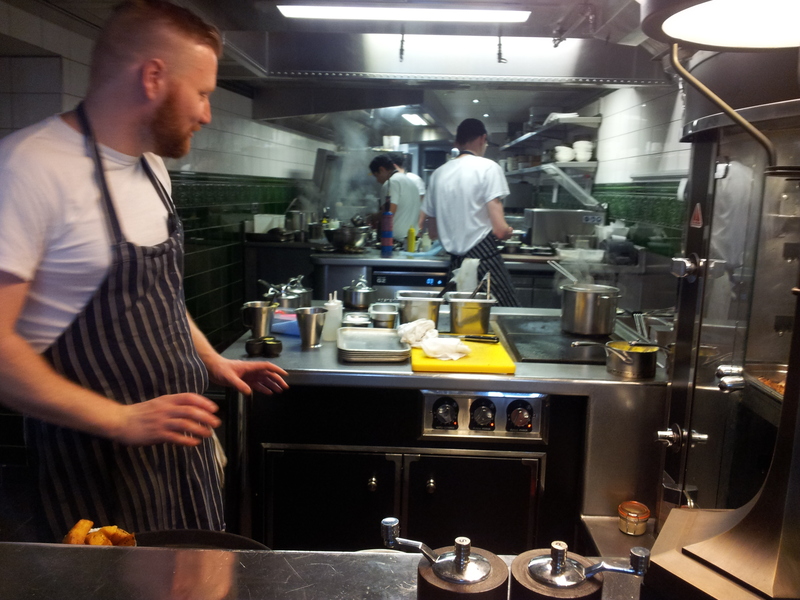 The rotisserie is a mad scientists contraption sitting near to the bar at the kitchen end. Your little half boned quail sits happily in there for about 20 minutes. Then served, with forcemeat and whatever else is secretly in the stuffing…lovely in itself. But the sauce. Just astonishing. I actually closed my eyes and held my breath. I didn’t want the moment to end. Sorry, that sounds loopy. But you will do the same. Trasna (Now of Rebellion Brewery fame) told me once that food that is fought over (or any bad atmosphere) always tastes as if it has been. We have the opposite at The Coach. You can feel the love. There’s a lot of competition for your hard earned cash in the eateries of York. We had arrived mid afternoon. Had had a majorly meaty few days – so tried our luck early doors with a place that was full at 6 pm, and turning people away from the full restaurant from 6:30. This bodes well- or maybe just have very few covers?! I shouldn’t have worried. Authentic down to very chatty waiting staff and bar manager (we got in by having a set of high stools right at the bar…you do see it warts and all there!). We were tired enough not to want to think…so ‘intro to tapas’ brought us 6 plates, 3 of them veggie. Calamares, (felt like we were in Spain) Meatballs in chilli and lemon grass (lovely subtle spices, and probably the most fought over dish! ), caramelised Chorizo with potato…I can hear you salivating! Mushrooms with caramelised shallots and a perfect vegetable risotto. We had a flight of sherries with this – recommended excitedly by the waiting team – and it does work perfectly. 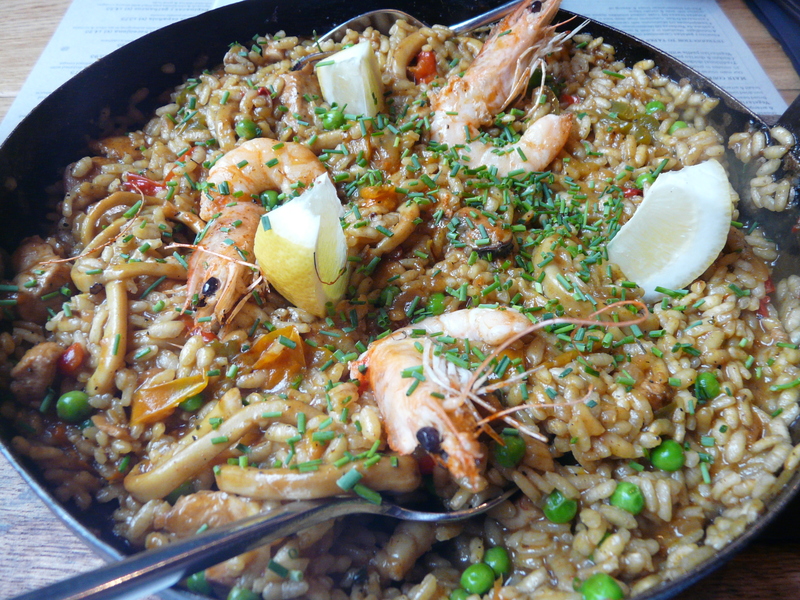 So much so, we booked for the next day to have chicken and seafood paella…and here is that review! We didn’t want to spoil it by filling up on big starters, so had a Fino flight of sherries with olives and mixed nuts. The paella arrived totally moist, steamy and heady. Sharing a whole frying pan of the dish felt like too full on to start, but it wasn’t. I suppose the slight hint of heat, the freshness of the fish, the chicken having absorbed so many flavours, and the rice just sucking up everything…lets just say the crianza Rioja was not overwhelmed, but enjoyed itself in fine company. It is worth booking. Great find. Enjoy the food and the people. Staff are a great added extra!